If Biologics will help increase HDL in wide market penetration, the market share of Statins will be negatively impacted. The biologics was developed by NIH funding, as reported on 2/14/2012, see last section, below. In an Interview I had with the VP of Scientific Affairs at AstraZenaca on 3/18/2013, the Executive Dr. D.S., MD, PhD, told me that the Cardiovascular Therapeutic Area at AstraZeneca is at present and in the future, probably the most important one of all of its businesses to date, thus, the position he is interviewing for, Director of Scientific Affairs Cardiovascular, will be the most powerful one within the Scientific Affairs Office. 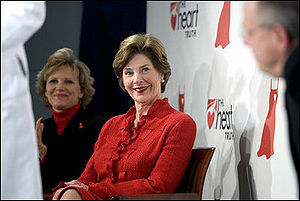 VP said, “the position will be beyond BRILINTA, or Cardiovascular.” A candidate not found yet. AZ keeps on calling, Keeps searching. Like several other top 10 pharma companies, AstraZeneca ($AZN) saw its R&D expenses climb somewhat in 2011. But this year, as CEO David Brennan unveiled the annual results for 2011, he started with a new restructuring plan. And R&D is intended to bear some of the biggest cuts. Hit with sliding profits and eviscerated by analysts for one of the weakest late-stage pipelines in the Big Pharma business, Brennan had to do something significant. Of more than 7,000 pink slips being readied, 2,200 were being reserved for R&D as the company moved to shutter R&D facilities in Soedertaelje in Sweden and Montreal. Neuroscience, once a key feature in the pipeline, is being scaled way back, with plans to field a “virtual” team in key hubs. AstraZeneca became the poster child for the R&D quagmire when Forbes‘ Matthew Herper concluded that AstraZeneca had the worst ratio of R&D costs to approvals in the industry. For a company that went 6 years without a drug approval ahead of the 2009 OK for Onglyza, accumulated setbacks have reached a breaking point. AstraZeneca, though, can’t cut its way to a turnaround in R&D. That’s going to take new programs and new technologies. It only began to address the issue with a licensing pact for a slate of Amgen antibodies. Research chief Martin Mackay was quick to follow up by telling Reuters‘ Ben Hirschler that more deals were coming. And indeed just weeks later, AstraZeneca acquired a late-stage gout drug with the $1.26 billion buyout of Ardea. The fact that AstraZeneca didn’t bother to stick with its disease strategy, and quickly indicated that it wouldn’t in the future, underscored just how crucial it is to move fast. Nevertheless, AstraZeneca will find it hard to shake its legacy of failures. Just weeks ago the company was forced to wash its hands of a billion-dollar deal with Targacept ($TRGT) for a prospective depression drug that failed 4 out of 4 late-stage studies. And as criticism mounted, Brennan has been forced to adopt a defensive posture. AstraZeneca today announced that MedImmune, its global biologics research and development arm, has acquired AlphaCore Pharma, an Ann Arbor, Michigan-based biotechnology company focused on the development of ACP-501, a recombinant human lecithin-cholesterol acyltransferase (LCAT) enzyme. Cardiovascular and metabolic disease is a core therapy area for AstraZeneca’s small and large molecule research. In 2012, results from a Phase I clinical trial of ACP-501 met the primary safety and tolerability endpoints. No serious adverse events were reported. ACP-501 also met the study’s secondary endpoints by rapidly and substantially elevating HDL cholesterol. The data from this study support ongoing clinical development of ACP-501. In another early-stage bet, AstraZeneca’s MedImmune unit acquired the biotech AlphaCore Pharma. The deal comes as AstraZeneca ($AZN) reboots a floundering R&D effort and adds a recombinant LCAT enzyme therapy from AlphaCore that could combat cardiovascular disease. MedImmune, the biologics division of Astra, faces years of additional development before AlphaCore’s ACP-501 becomes part of the London-based pharma group’s late-stage pipeline, which has many holes yet to be filled. Last year, Ann Arbor, MI-based AlphaCore touted Phase I work on ACP-501, reporting that the enzyme therapy was well-tolerated and quickly boosted levels of HDL or “good” cholesterol in patients. New AstraZeneca CEO Pascal Soriot has signaled his desire to wager on new science amid an overhaul of R&D announced last month that will cost 1,600 research jobs across the company and after the ouster of former R&D chief Martin Mackay in January. Bahija Jallal, executive vice president of MedImmune, survived the round of cutbacks and plans to pursue new biologics such as ACP-501, which she stated could treat both acute and chronic cardiovascular disease. The ACP-501 is an engineered version of the natural LCAT enzyme from the liver that plays a role in ridding the body of cholesterol and keeping up levels of beneficial HDL cholesterol. The candidate could aid millions of patients with cholesterol problems as well as those with a rare inherited disease called familial LCAT deficiency that robs the body of the enzyme. The AlphaCore buyout comes on the heels of AstraZeneca’s sizable $240 million upfront payment to Moderna Therapeutics to get in early on the startup’s preclinical programs that use messenger RNA to turn cells in the body into makers of healing proteins. The financial details of the AlphaCore buyout weren’t disclosed. Still, analysts expect Soriot to pull the trigger on larger deals to bolster the late-stage pipeline or even provide marketed products as AstraZeneca faces the impact of patent expirations on blockbuster cholesterol pill Crestor and the heartburn med Nexium. As Reuters noted, the company has only 6 drugs in late-stage development and aims to double that number by 2016. ANN ARBOR, Mich. & ROCKVILLE, Md.–(BUSINESS WIRE)–AlphaCore Pharma, a biopharmaceutical company, and Advanced Bioscience Laboratories (ABL), a biomedical contract research and manufacturing company, today announce funding from the National Institutes of Health, National Heart, Lung and Blood Institute (NHLBI) “Science Moving towards Research Translation and Therapy” (SMARTT) program, to manufacture recombinant human lecithin-cholesterol acyltransferase (rhLCAT) for the treatment of familial LCAT deficiency. Also known as ACP-501, rhLCAT represents a promising new approach in the fight against atherosclerotic cardiovascular disease, and has demonstrated preclinical efficacy in promoting HDL maturation and cholesterol flux, a natural process by which cholesterol is removed from the body. Currently, ACP-501 is in Phase 1 clinical development with the eventual goal of reducing the risk of cardiovascular events in patients presenting with acute coronary syndrome. Manufacturing support from the NHLBI SMARTT program will enable production of additional material that will be used to determine the safety and efficacy of rhLCAT enzyme replacement therapy for patients with familial LCAT deficiency – a potentially life-threatening illness for which there is no FDA-approved treatment. “This is a significant step towards developing a treatment for familial LCAT deficiency. We are pleased by the strong support from the NHLBI and ABL and look forward to advancing this program.” said AlphaCore President, Bruce Auerbach. 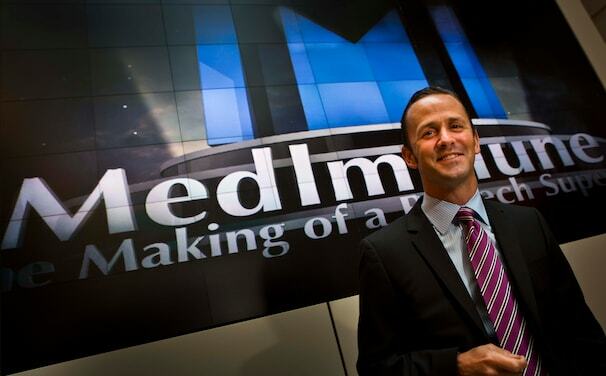 Peter Greenleaf, chief executive of MedImmune. (Jeffrey MacMillan – JEFFREY MACMILLAN)Peter Greenleaf is stepping down down as president of Gaithersburg-based biotechnology giant MedImmune, according to a company spokesman, to take the helm of parent company AstraZeneca’s Latin America business. He will be replaced by Bahija Jallal, who currently serves as MedImmune’s executive vice president of research and development. Jallal joined the company in 2006 as vice president of translational sciences. The leadership change comes as MedImmune was formally designated a biologics research and development site for AstraZeneca, meaning Jallal will report directly to AstraZeneca chief executive Pascal Soriot, said company spokesman Mike O’Brien. He added that MedImmune’s commercial organization will now report into AstraZeneca’s North American business and its manufacturing group will be folded into AstraZeneca’s global operations group. O’Brien said Greenleaf will continue to be based in Maryland, where he has become a figure­head of sorts for the life sciences industry. Greenleaf was an advocate for Democratic Gov. Martin O’Malley’s InvestMaryland initiative, which allocates state money for investment in local upstarts. He serves as chairman of the Maryland Venture Fund Authority, a nine-member board assigned to oversee its implementation. MedImmune has long been an anchor of Maryland’s biotechnology hub along the Interstate 270 corridor. The company was purchased by AstraZeneca in 2007 for $15.6 billion, a sales price that some industry observers still question. The Washington Business Journal reported the personnel changes earlier. Mineo C, Yuhanna IS, Quon MJ, Shaul PW., (2003). HDL-induced eNOS activation is mediated by Akt and MAP kinases. J. Biol. Chem., 278:9142–9149. Whereas the functional link between HDL and eNOS has been appreciated only recently, the relationship between HDL and endothelium-dependent vasodilation has been known for some time. In studies of coronary vasomotor responses to acetylcholine, it was noted in 1994 that patients with elevated HDL have greater vasodilator and attenuated vasoconstrictor responses (Zeiher et al., 1994). Studies of flow-mediated vasodilation of the brachial artery have also shown that HDL cholesterol is an independent predictor of endothelial function (Li et al., 2000). The direct, short-term impact of HDL on endothelial function also has recently been investigated in humans. One particularly elegant study recently evaluated forearm blood flow responses in individuals who are heterozygous for a loss-of-function mutation in the ATP-binding cassette transporter 1 (ABCA1) gene. Compared with controls, ABCA1 heterozygotes (six men and three women) had HDL levels that were decreased by 60%, their blood flow responses to endothelium-dependent vasodilators were blunted, and endothelium-independent responses were unaltered. After a 4-hour infusion of apoAI/phosphatidylcholine disks, their HDL level increased threefold and endothelium-dependent vasomotor responses were fully restored (Bisoendial et al., 2003). It has also been observed that endothelial function is normalized in hypercholesterolemic men with normal HDL levels shortly following the administration of apoAI/phosphatidylcholine particles (Spieker et al., 2002). Thus, evidence is now accumulating that HDL is a robust positive modulator of endothelial NO production in humans (Shaul & Mineo, 2004). 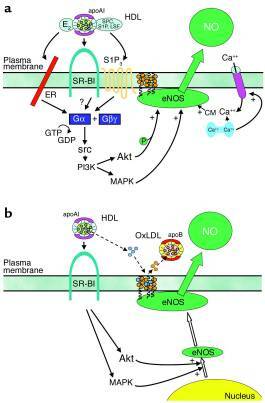 (a) HDL causes membrane-initiated signaling, which stimulates eNOS activity. The eNOS protein is localized in cholesterol-enriched (orange circles) plasma membrane caveolae as a result of the myristoylation and palmitoylation of the protein. Binding of HDL to SR-BI via apoAI causes rapid activation of the nonreceptor tyrosine kinase src, leading to PI3K activation and downstream activation of Akt kinase and MAPK. Akt enhances eNOS activity by phosphorylation, and independent MAPK-mediated processes are additionally required (Duarte, et al., 1997). .Eur J Pharmacol, 338:25–33. HDL also causes an increase in intracellular Ca2+ concentration (intracellular Ca2+ store shown in blue; Ca2+ channel shown in pink), which enhances binding of calmodulin (CM) to eNOS. HDL-induced signaling is mediated at least partially by the HDL-associated lysophospholipids SPC, S1P, and LSF acting through the G protein–coupled lysophospholipid receptor S1P3. HDL-associated estradiol (E2) may also activate signaling by binding to plasma membrane–associated estrogen receptors (ERs), which are also G protein coupled. It remains to be determined if signaling events are also directly mediated by SR-BI (Yuhanna et al., 2001), (Nofer et al., 2004), (Gong et al., 2003), (Mineo et al., 2003). Source for HDL-eNOS Figure: Shaul & Mineo (2004). HDL enhances NO production by eNOS in vascular endothelium. eNOS is not Activated by Nebivolol in Human Failing Myocardium. Nebivolol is a highly selective beta(1)-adrenoceptor blocker with additional vasodilatory properties, which may be due to an endothelial-dependent beta(3)-adrenergic activation of the endothelial nitric oxide synthase (eNOS). beta(3)-adrenergic eNOS activation has been described in human myocardium and is increased in human heart failure. Therefore, this study investigated whether nebivolol may induce an eNOS activation in cardiac tissue. Immunohistochemical stainings were performed using specific antibodies against eNOS translocation and eNOS serine(1177) phosphorylation in rat isolated cardiomyocytes, human right atrial tissue (coronary bypass-operation), left ventricular non-failing (donor hearts) and failing myocardium after application of the beta-adrenoceptor blockers nebivolol, metoprolol and carvedilol, as well as after application of BRL 37344, a specific beta(3)-adrenoceptor agonist. BRL 37344 (10 muM) significantly increased eNOS activity in all investigated tissues (either via translocation or phosphorylation or both). None of the beta-blockers (each 10 muM), including nebivolol, increased either translocation or phosphorylation in any of the investigated tissues. In human failing myocardium, nebivolol (10 muM) decreased eNOS activity. In conclusion, nebivolol shows a tissue-specific eNOS activation. Nebivolol does not activate the endothelial eNOS in end-stage human heart failure and may thus reduce inhibitory effects of NO on myocardial contractility and on oxidative stress formation. This mode of action may be of advantage when treating heart failure patients. Brixius K, Song Q, Malick A, Boelck B, Addicks K, Bloch W, Mehlhorn U, Schwinger R, (2006). eNOS is not activated by nebivolol in human failing myocardium.